Yesterday at HP Discover, CEO Meg Whitman introduced Hewlett Packard Enterprise, the result of HP’s split into two companies. HP, Inc. represents the systems and printer group. Hewlett Packard Enterprise (HPE) is for the enterprise IT business, which includes HP Helion, its Cloud Foundry-based app development platform. In her keynote, she explained what the new HPE reflects about the market and the company’s approach. The logo is simply a green rectangle and the name of the new company on a white background with a black sans-serif font. Whitman said it is supposed to represent simplicity which reflects the company’s past, and a window, so to speak, into the future. It’s meant to fit with CEO Meg Whitman’s discussion about HP’s focus on “ideas” and the idea economy. In her keynote, she featured new companies like Vimeo and Uber. She pointed to Uber and how it is disrupting the taxi industry. She warned of how companes in all industries can get disruped by these startups that know how to go from idea to value. She said that there is this shift from traditional to new IT. Apps and data are everywhere. Whitman talked about how companies can use any number of services to power their business. Success is determined by how fast a company can adapt and scale so they don’t get swamped like taxi companies that are facing the efficiency of companies like Uber that develop and run on software. What Does This Mean for Hewlett Packard Enterprise? So what does this shift from ideas to value mean for HPE? You hear HPE executives talk more about developers, the DevOps movement, and how the company is viewing analytics and the way it works in operations. I sat down with Roy Ritthaler, vice president of product marketing at HP Software, who talked about how customers are now accepting automation. As this automation movement accelerates, HP is developing a DevOps product set as illustrated in the launch of LeanFT, which we wrote about yesterday. It’s a paradox of sorts. There are young companies that have lots of funding building new technology stacks. They are emboldened by their success and expand using new models that older companies do not have. There are mature companies, customers, using analytics to draw the value out of monolithic applications. Then there is the paradox that face mature technology companies like HP. They have customers who are just starting to adapt to a new technology ecosystem. For these customers, the Internet-scale companies are models, symbols. The customers are not ready, nor do they strive, to be like an Uber or a Vimeo. That puts a company like HPE in a triangle of sorts. The Internet-scale companies have ideas that they turn into software, scaling quickly using services from various API endpoints to create experiences that make people glad to use the service. Have you ever used Lyft and been so pleased just to get out of the car and not engage in a transaction with the driver? Customers want to change, but not super fast. HPE has to adapt and adjust their pace to both the Internet-scale companies who they have to keep pace with and customers who want to change but also have existing systems and software that they depend on for their everyday business. 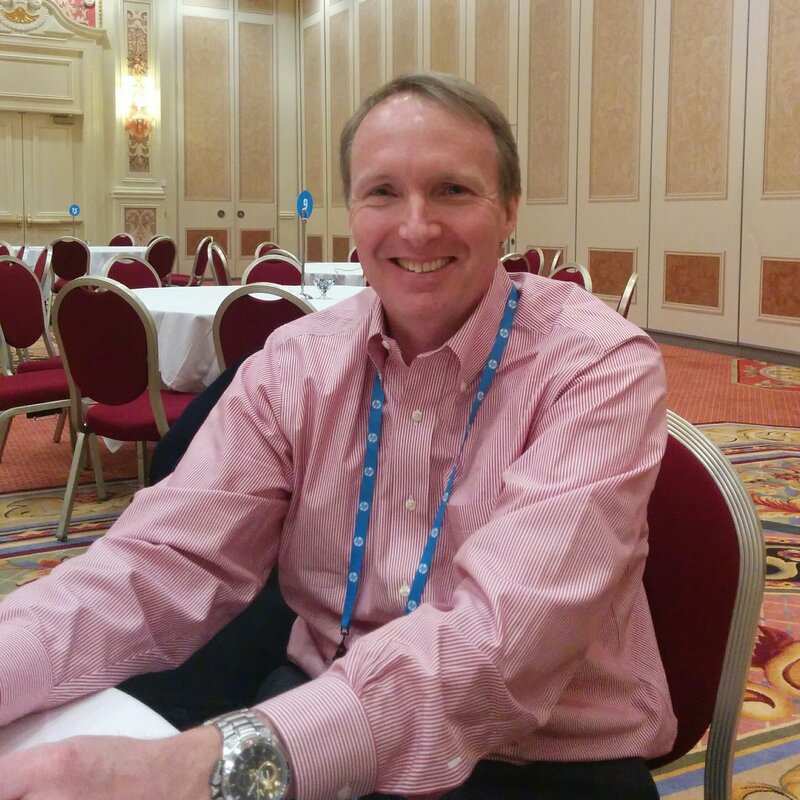 Change at HP is coming through efforts such as operations analytics. For example, Ritthaler’s group collects data using Hadoop and other means. They’ve developed their own platform called Haven on Demand. They have learned to apply data analtytics through Vertica and the APIs available through Autonomy and its API services. Vertica is an SQL analytics platform and Autonomy has search capabilities to collect data from unstructured data, video and audio. In at least one use case, the data collected through Autonomy is used with social search sentiment from the app and the device data. It can then determine for the developer what performance and other metrics looks like. The operations group is all about analytics, Ritthaler said. “We are replacing people with robots,” is a message his group talks about. People are getting replaced by robots in their operations, and that’s in many respects the core of the current change in the market. Automation is now more accepted than ever, but orchestration is still more conceptual, and full transformation is yet to come. What you see at HP is how DevOps is driving the changes in the company. While Ritthaler’s group is using analytics platforms to drive operations changes, it is also providing guidance for its own internal customers, whether they are those building cloud native apps with Docker, or those that are trying to squeeze more out of a virtualization environment. This again reflects this triangular scenario. On one hand, the Ubers of the world are aggressive, building analytics dashboards to make their service ever more efficient. HP wants to offer services that give customers tools that help them replace people with robots. But they can only be just so aggressive. Customers are not ready for too much change. Getting into a conversation about containers and how they serve as processes gets closer to this concept of ideas and valuation that Uber and the other Internet-scale companies have developed. These are companies that have immutable infrastructure, continuous integration services, and platforms of their own that collect data and filter through analytics services. The question about customers and how they learn to scale ideas to valuation is also pertinent to HPE. The answer is in efforts that you see from operations management and the effort to work more closely with developers. How quick these companies move to valuation is the big question. It has taken the HP boat a while to turn its course. But turning it is the hardest part. They’ll have to think through how they open their platform and build data businesses that are driven by analytics. They are getting there. But they also have to think about being more open with their platforms. If they can do that, then history tells us developers will be far more receptive to accepting HP as an organization that is part of an ecosystem of progressive and innovative companies. HP is a sponsor of The New Stack.